Trachoma, a disease caused by bacteria called Chlamydia trachomatis, affects more than 80 million individuals worldwide, and 8 million persons are blind because of this infection. Inflammation of the conjunctiva (lining of the eye surface) causes irritation and scarring, leading to blindness if trachoma is not treated. Trachoma is a serious public health problem in developing countries. Better sanitation and improved clean water supplies are ways to decrease the prevalence of trachoma and reduce trachoma-related blindness. Trachoma occurs in children as well as adults in all parts of the world. Women are much more likely than men to develop trachoma or become blind from trachoma. In the United States, blindness due to trachoma has been eliminated because of widespread prevention and treatment efforts. Since trachoma is a contagious disease, it can occur in family groups or in persons who live in close quarters. The bacteria are spread by secretions from the eye or the nose and pass from person to person. Flies can also pass on the bacteria, especially in areas that have poor sanitation. The September 2, 2009, issue of JAMA includes an article about the effects of mass distribution of an antibiotic for treatment and prevention of trachoma. Antibiotics, in oral form or in eye ointment, can be used to treat trachoma. Preventing trachoma in larger populations can also be done by administering antibiotics to persons who do not yet show active signs of the disease. Surgical treatment may be necessary to correct the inversion of eyelashes caused by scarring. Permanent eye damage can occur from irritation and inflammation and can be made worse by eyelid inversion. Improved sanitation, better water supplies, and more hygienic living conditions all may help to reduce trachoma and its main complication, blindness. Eye products, including cosmetics, ointments, or contact lenses, should never be shared. There is currently no vaccine available for trachoma. 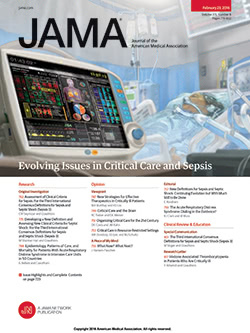 To find this and previous JAMA Patient Pages, go to the Patient Page link on JAMA 's Web site at http://www.jama.com. Many are available in English and Spanish. A Patient Page on causes of visual impairment was published in the October 15, 2003, issue.